This is DIDO, a pocket trawler form the 1970s, our mobile home on the water during summer. DIDO becomes smaller the bigger the kids get, but still we love our small dream of freedom and enjoy each day on board. This site is dedicated to the history of the Albin 25-type in general, and our DIDO, her modifications, and our experiences with her in particular. 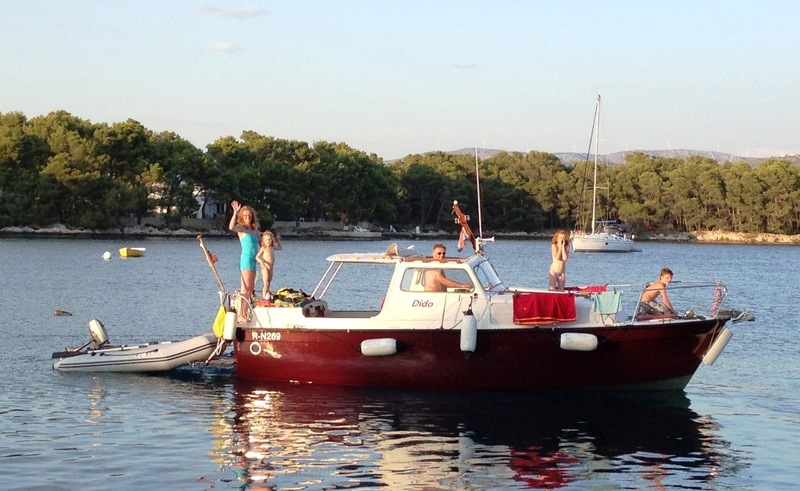 Albin25.eu came into being when a former Albin owner - Craig - sold his A25AK Salena. He had tons of photos on his website, which were of fantastic use for us when we were looking for our Albin. Before his server went down he sent me a copy of his website. Most of the information from his site you will now find here. Apart from that heritage you will find our own history of boating here, and especially our Albin 25 AK "Dido", the documentation of the modifications that we made, our trips with her, and some more things related to these issues. Furthermore, I plan to maintain this site in English, as there is an awful lot of information available on Albin related sites, however they are Dutch, Swedish, Danish, all languages none of which I speak. My native language is German. Thus I'd really appreciate if you helped me to extinguish Germanisms and various other idiomatic oddities. We are Andreas & Hilde with three Kids (Achill, Medea, Iphi) and our Albin 25 AK "Dido", #1178. We live close to Vienna, Austria. Most time of the year Dido is berthed on the river Danube. More or less the whole summer we spend on the Adriatic.